BAF Scalloped O'Brien Style Potato Casserole - Reduced Sodium, 264 servings (4oz) per case, 6/2.25 lb. ctn. Thin sliced potatoes in a rich, buttery sauce with red and green peppers. Yield: 264, 4-oz servings per case (44 servings per carton). Foodservice potato casseroles are better than ever, now with 50% less sodium, gluten free, no artificial colors or flavors and no BHA/BHT. 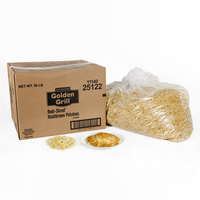 Foodservice Rewards and USDA Foods Processing Program participant. Potato casseroles are a classic, comforting side dish that your patrons love. Make your best sides even better by adding additional ingredients to this base for your own signature side. 1: Add 5 quarts boiling water (212°F) for convection oven (4 1/2 quarts for conventional) and 4 ounces unsalted butter to a 2 1/2" deep full-size steamtable pan. 2: Stir in sauce mix until dissolved. 3: Add potato slices. Stir. 4: Bake in a convection oven at 300°F for 45-60 minutes. For conventional oven, bake at 400°F for 45-60 minutes. [Alternate] For half carton prep, use half of each ingredient amount specified. Cook time and temperature remain the same. 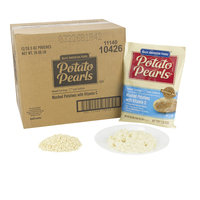 Potato Pearls® Smart Servings™ Mashed Potatoes w/Vit C - Low Sodium, 492 servings (4 OZ) per case, 12/26.5 oz. pch. Idahoan Real Mashed Pouch--12 ct/26 oz. Idahoan Naturally Mashed Low Sodium Carton--6 ct/4.687 lb.